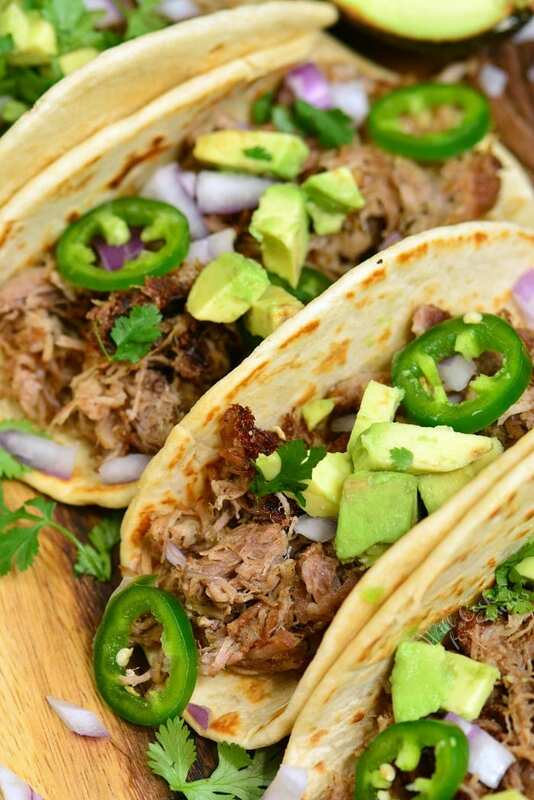 Carnitas is amazingly flavorful Mexican pulled pork made with aromatic spices and citrus. This pork carnitas are easily made in an Instant Pot in just a little oven an hour and comes out so juicy, soft, and tender. You can just as easily make carnitas in a Crock Pot. After this tasty pork is gently shredded with a fork, it’s quickly crisped in a skillet for a few minutes. 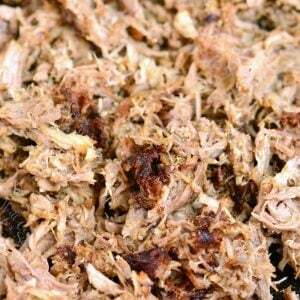 Carnitas can be use in anything from tacos, to nachos, to sandwiches, and taquitos. Pulled pork is great in different tacos and my Pulled Pork Tacos with Tropical Slaw are some of our favorites because of the sweet and citrus flavors. Pork nachos is another great recipe where you can use these carnitas. If you’re not familiar with carnitas yet, I recommend that you get acquainted very fast. This pulled pork dish is worth trying as soon as possible because once you do, you will be making it over and over. Carnitas are a native Mexican dish and it literally means little pieces of meat. They are traditionally made out of pork that has been slowly cooked to produce soft, tender meat. Tender, shredded meat is then quickly cooked at high temperature to get crispy edges. The result is amazing! Soft and tender meat that is full of flavor from seasoning, citrus, and vegetables it is cooked in. And then, a touch of crispy ends to put it over the top. After making carnitas so many times, I am still amazed how soft and juicy texture of this pulled pork stays even after spending a couple of days in the refrigerator or being frozen. 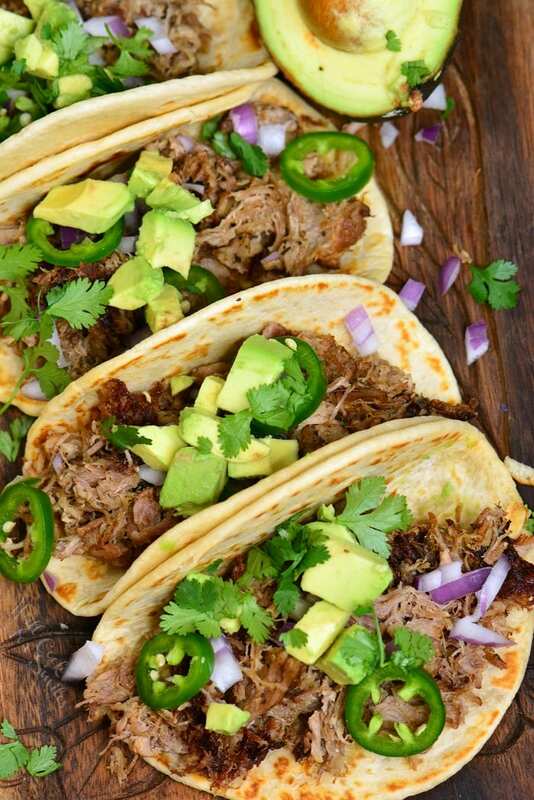 With the modern convenience of an Instant Pot, you can be enjoying these pork carnitas in about an hour and a half. It takes 5 minutes to combine the ingredients in the pot, an hour to pressure cook it, and a few more minutes to pull pork and sear it. Cut pork shoulder in 2-3 pieces and place it in an Instant Pot. Add diced onion, jalapenos, smashed garlic, and bay leaves. In a mixing bowl, combine chicken broth, juice from limes, juice from oranges, oregano, cumin, chili powder, and salt. Mix it well. Pour the mixture all over the pork and veggies. Close the lid and make sure it’s latched. Turn the valve to “seal” and set the Instant Pot to cook on high pressure cook mode for 60 minutes. Turn off the Instant Pot when it’s done and let it naturally release for 10 minutes. You can do manual release after that. Store pulled pork in an air-tight container and save a couple of cups of cooking broth in a separate container. Essentially, making carnitas in a crock pot is very similar to making it in Instant Pot but it will be cooking for 6-8 hours. 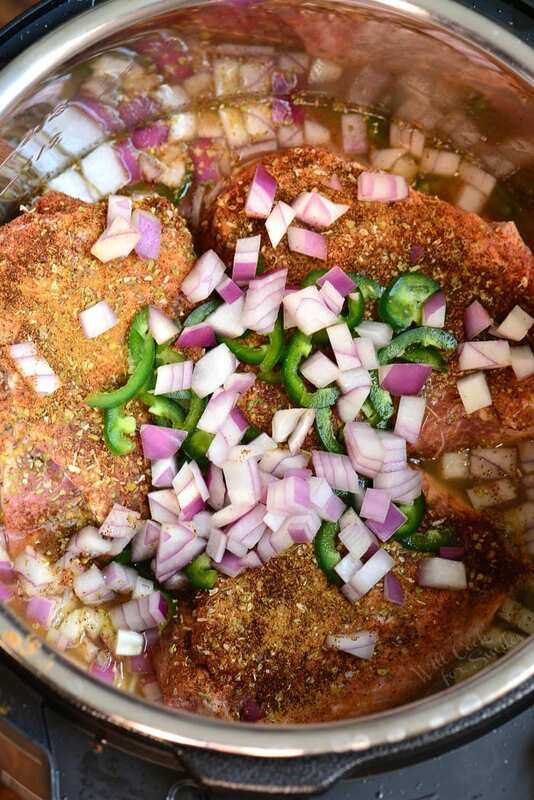 Place pork shoulder in a Crock Pot. In a mixing bowl, combine chicken broth, juice from limes, juice from oranges, oregano, cumin, chili powder, and salt. Pour the mixture over pork and veggies. Cover the Crock Pot with a lid and cook on LOW for 6-8 hours or on HIGH for 4-6 hours. I am a big proponent of crisping carnitas on stove-top, in a skillet or another cooking pan. After trying to crisp it in the over, under the broiler, the result is just not the same. What’s missing is one important step of adding broth that pork was cooked it and letting it cook out. This infuses pork with so much extra flavor, you just can’t beat that. Make sure to preheat the skillet (or another cooking pan) over medium-high heat. Add a little bit of oil to just grease the bottom of the pan. 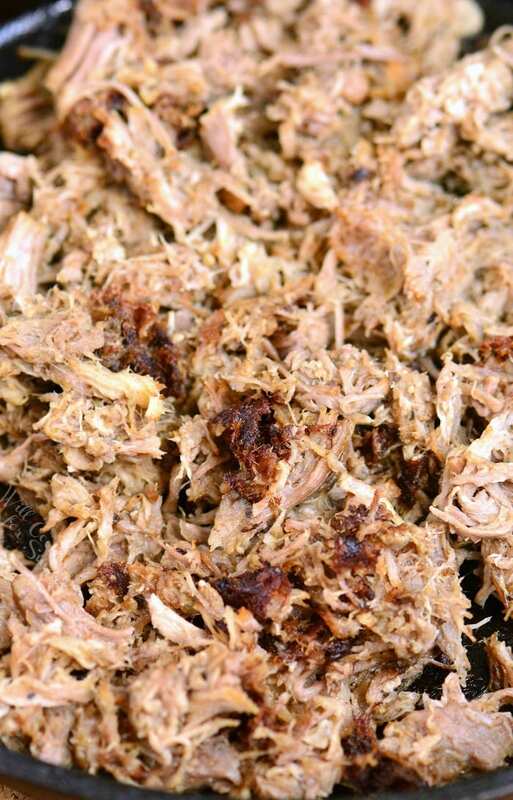 You can choose to brown a portion of pulled pork carnitas or all at the same time. Whichever amount you choose, select the pan accordingly because you don’t want to overcrowd the meat. Saute for about a minute and then add some of the cooking broth into the pan, quickly stir and let the juice cook out as the bottom of the meat browns. Stir a couple of times and let a few more pieces get brown. Take the pork out of the pan and serve whichever way you like. 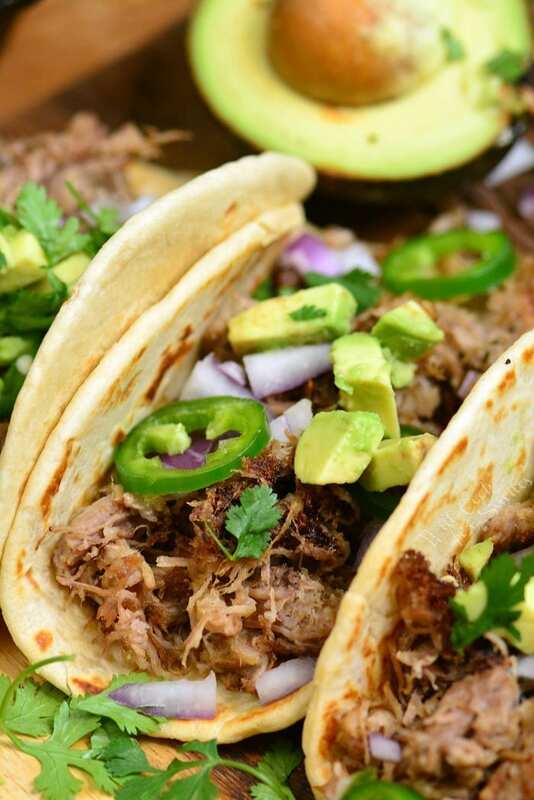 Carnitas are so versatile, you can do just about anything with it. My favorite way is to make in tacos or nachos. They can also be rolled into tortillas and baked to to make taquitos. Serve the as a main dish with some rice and beans. Make them into enchiladas instead of chicken. For an fast and easy lunch, make a simple pork sandwich with carnitas in a soft bun, avocados, and onions. Pork Carnitas are easily stored in the refrigerator, in an air-tight container with a lid. Store broth the pork was cooked in separately and add it to the pan when crisping the pork. You can also freeze carnitas meat right after you pulled it. Portion meat into freezer bags, let all air out and seal. Label, date and freeze them. Broth can also be frozen either in a freezer bag or freezer container with a lid. To defrost, pull meat from the freezer straight into the fridge and let it defrost overnight in the refrigerator. 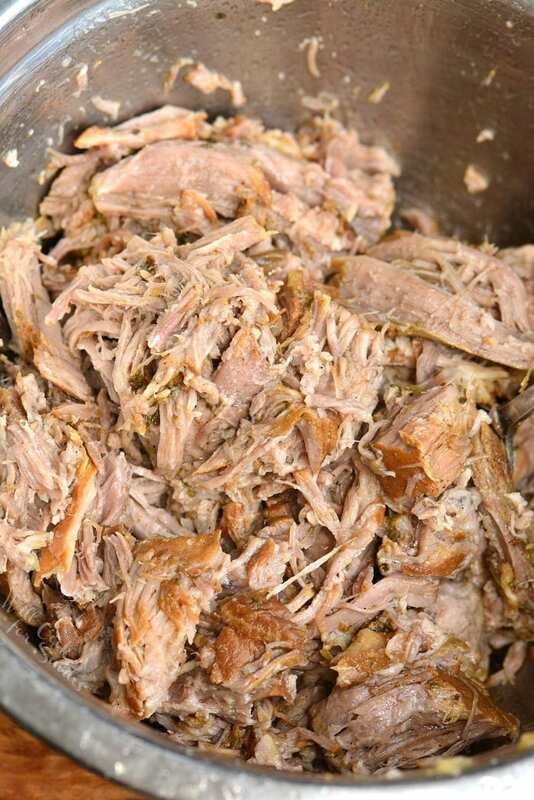 Pork carnitas are easily made in an Instant Pot in just a little oven an hour and comes out so juicy, soft, and tender. Cut pork shoulder in 3 pieces and place it in an Instant Pot. These carnitas look so flavorful! That is such a good idea to crisp the meat on the stove. I’m trying that next time! We made nachos with the carnitas! SO GOOD!! !